The humble banana is under attack by a disease that is spreading around the globe, and threatening Latin America's all-important export industry. The industry is so worried about it, that it moved this week's International Banana Congress from Costa Rica to Miami at the last minute so that attendees wouldn't transport the disease to the region with the contaminated dirt on their shoes. Latin America is the primary source of bananas for North America and Europe. The disease -- known as "Panama disease" or "Fusarium wilt" -- has already spread from Asia to parts of Australia, Africa and the Middle East. It specifically affects the Cavendish banana, which is the fruit that consumers in the West are accustomed to eating. The United Nations Food and Agriculture Organization warned this month that the $36 billion banana industry must act "to tackle one of the world's most destructive banana diseases." 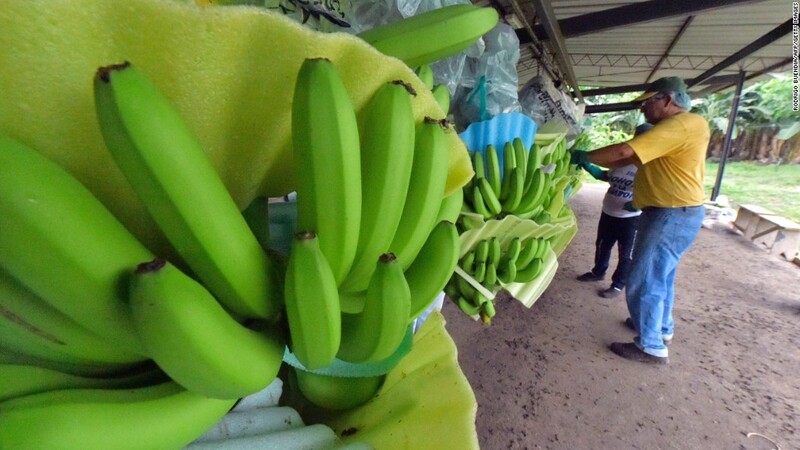 Taiwan has created a number of "mutant" Cavendish bananas that are being tested in the Philippines and China, according to Inge Van den Bergh, a senior banana scientist at Bioversity International in Belgium. "They're quite promising," but they're not necessarily as tasty or suitable for long-distance transport, she told CNNMoney. There's no "silver bullet solution," she said. For now, banana prices in Western grocery stores aren't rising since Latin America has been spared. "The spread of Fusarium wilt could have a significant impact on growers, traders and families who depend on the banana industry," warned plant pathologist Fazil Dusunceli from the UN's Food and Agriculture Organization.